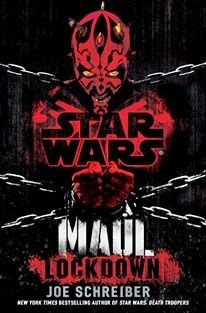 The official Star Wars Books Facebook Page has released a new micro excerpt from Joe Schreiber's upcoming novel Star Wars: Maul: Lockdown. The novel is set prior to the events of The Phantom Menace and features Darth Maul sent of a dangerous mission by Darth Sidious and Darth Plagueis. The novel will hit shelves on January 28th, 2014. “Yes, of course.” Sidious regarded him speculatively. What exactly was Plagueis telling him? Did the Muun harbor his own dark suspicions about what Sidious had hoped to achieve in sending Maul to Cog Hive Seven? Or was Plagueis simply probing him for more detail? The air-taxi docked, and Sidious realized that he’d arrived at the Senate Rotunda. The cab’s hatch released with a faint sigh, and as he began to step out, he felt Plagueis’s hand take hold of his wrist. “I know we are together on this,” Plagueis said, “as equals.” Plagueis withdrew his hand. He was still gazing out at Sidious when the air-taxi’s hatch closed between them and it lifted away from the Senate Plaza, leaving him standing there alone.